A few years ago, children's favourite Thomas the Tank Engine was attacked by a Canadian academic for its "conservative political ideology" and failure to adequately represent women. It was in the Daily Telegraph, so could have been a spoof (see link at bottom). Had it been April 1st, one could have been certain. But then again, such things are possible. Apparently the trouble is that the engines have boys' names and the carriages have girls', such as Annie and Clarabel, which makes it sexist. Eventually came Daisy the railcar, which solved the problem a bit, but she took a long time to settle down and could misbehave at times. A lot has happened since the last Thomas story was written, what with the railways being privatised and so many new trains replacing the old ones. There are real possibilities here. How would the engines react to have to share their shed with a stinker like a Voyager? Here is an attempt to bring things up to date. When the Big Railway was privatised, many of the old trains were replaced after a while. Some of them came to live on Sodor. First to arrive were the two emus, called Biggie and Ciggie, who came with a diesel locomotive called Edgar. But Edgar turned out to be not very strong because he really needed electricity to go properly, and as there wasn't any, the Scottish twins Donald and Douglas were put in charge of Biggie and Ciggie. They are only used during the summer as they have no steam heating. Biggie and Ciggie have become very popular because the seats are comfortable, and passengers like to travel in Biggie's buffet car where they serve teas with scones, cream and home-made strawberry jam in the afternoons and real draught beer in the evenings. After the trial on the branch line with Ciggie, Edgar was used inside the carriage workshop, where he could run when he was connected to a long cable and plugged in just like a vacuum cleaner. He has turned out to be quite useful, but he is hardly ever seen outdoors. A few summer visitors have helped out for a while. Thumper came for a few months whilst Arthur was having his overhaul, and the next season came Jack Spratt, who was very thin and sounded like Thumper. Jack was used on the main line whilst Henry was getting new tubes for his boiler. There have also been a few foreign visitors who stayed for a while; unlike humans, engines from different countries can talk to each other perfectly well. Hermann had three domes and would never talk about the work he had done, which made the others suspect he had done something very bad in the past. Maurice smelled of garlic and boasted about how fast he was, but was quite nice really. Everyone liked Sven, a quiet and friendly little tank engine with big headlamps, who wore a red snowplough even in the summer and smelled faintly of a mixture of cinnamon and coffee. Sven, a distant relative of Arthur, was very clever but never said much except when the others admired his delicately machined rods and red wheels. Then he would nod in agreement and once said, modestly, "Not bad! They made a good job of me, didn't they? Look at my oil cups - they have proper metal covers instead of the corks you've got." When engines are left on their own together, they often talk about coal, of course One night, Duck mentioned that Welsh steam coal was the best and that he hated the taste of anything else. This led to an argument, as Donald and Douglas disliked any coal that did not come from Scotland. Sven, who so rarely joined in a conversation, mentioned that he had been fed with logs of wood for a while. He said that they tasted delicious, and were cleaner than coal. They were not dusty and the smoke smelled nice, but he didn't feel so strong as when he was fed with coal. Another foreign visitor was Zoltan. The others all felt sorry for him because he looked so hideous and sad. He had an ugly face, pipes grew all over his boiler like ivy on a tree trunk, and he had two domes joined by a big pipe. Zoltan looked battered and was painted dull black. They wondered whether he was sad because he was ugly or if being ugly made him sad. One night he told them all about himself. He had run on the Emperor's railway, but then he had been sent to a place where the water was so dirty that all the engines got boiler-ache. That was why he was fitted with an extra dome and the pipe in between. He had also worked for the army for a long time and was badly treated. He was sad because of some of the things he had been made to do. "You shouldn't worry about what you look like", said Thomas, trying to cheer him up. "You could easily get a new shape. " Duck piped up, "Lots of engines have been in the army. My old mate Rod was always telling stories about the things he had done. It's a pity, though, that you never went to Swindon. You would have come back with a nice tidy tapered boiler without even one single dome, a brass safety-valve trumpet, a copper-capped chimney and a neat cab. Engines that went to Swindon always came out with the proper domeless Great Western look. I hate domes." "Haha! Talk about domes", said Henry. "You and Oliver have got bigger domes than any of us. Have you seen yourself? Great Western engines either have a huge dome or none. The rest of us have proper-sized domes." This business of domes was a sore point with all the engines, but especially for Duck. It was best not to talk about it. Duck was very proud of his dome and whenever he passed the station buffet he would try to steal a glimpse of it, reflected in the windows. None of this left Zoltan feeling any happier. "It isn't just my domes and pipes that make me look so ugly. There's my cylinders and valve gear too. I just look completely wrong. I'm the ugliest engine in the world." He started to sob. These engines were just shed company for Thomas and his friends, because when the Fat Controller measured them, he found they were too big to run on the railway. They used to be taken out into the yard on special days and run around a bit so that visitors could look at them but in the end, they were sent back to their own countries. Then there was Hans. He was bigger than Gordon, slightly streamlined, and looked very smart. His boiler and cab were not painted but left in the natural silver colour of the metal, which was kept polished. His wheels and rods were painted bright red. He always spotless even after a day's work. No speck of soot ever came out of his chimney. He was too big to run on the railway but worked on his own in the yard every day. He moved about very quietly. The other engines did not know what to make of Hans at first and thought he was stuck-up and unfriendly. Thomas cheekily asked him if he was really a steam engine. "Yesss!" hissed Hans, irritated. Thomas asked him where he kept his coal, as he couldn't see anywhere for coal on his tender. "I don't burn coal", said Hans. "I burn diesel. Just like you burn coal. I am very strong, clean and quiet. I am cleaner than any diesel. I use less diesel than a real diesel. I used to burn coal but oil is easier. Incidentally, I am much older than you think I am. I am older than some of the rest of you. I started off in the army so be careful how you talk to me." Hans impressed everyone, especially the Fat Controller. They could see that he had been telling the truth. But one morning, after he had been for a few weeks, Hans woke up with a worried look on his face. "It's my last day today - I'm off home to Switzerland tomorrow. There's a lot of work for me to do on the big railway there. I am going to be tested. I have got to compete with a diesel." After breakfast, he puffed out into the yard outside. There was a tremendous racket to be heard. It was a visitor who came to a stop on the track next to Hans. Two columns of blue-black smoke were shooting out of his roof like a volcanic eruption. "Hiya! Hank's the name." Hank was painted a red-brown colour, the same as the soft drink he was advertising. The name of the drink was painted in white flowing letters all the way along both of his ribbed sides, and he looked just like a giant soft drink can himself. "You all think yer better than me buchoo ain't. I'm the greatest'n ahrm gonna prove it." He spoke in a loud drawl. The two engines spent the day doing heavy jobs, and when they had finished, they played tug-of-war. Hank screamed for all he was worth, whilst Hans was almost silent, but neither budged, and in the end, the competition was declared a tie. Then came a whole season when nothing went right. It started just before Christmas, when Hank turned up again one frosty morning, this time with six shiny white and green carriages, and the special purple vans called Hatch and Match, one between Hank and the carriages, and the other at the back. The Fat Controller came out with Daisy's driver to meet them and looked doubtful when he saw Hatch and Match. Their presence was always a sign that the trains were going to get up to mischief. Hank uncoupled the front four carriages from the others. This is Emmie", he drawled. "She ain't said nut'n since ah picked 'er up. Just a squeak now n'then. I wuz told she was sometin called Lectrostar." Hank screamed off trailing blue smoke behind. The carriages, obviously brand new and fresh from the factory, stood silent. Emmie was wearing a lot of make-up, with fluorescent lipstick, dark eye-shadow, and long artificial eyelashes. The Fat Controller and Daisy's driver climbed into the cab. It was freezing cold inside and smelled of new plastic. They looked into the passenger compartment, where the seats and carpets were all carefully covered with polythene sheets. In the cab were rows and rows of switches, more rows and rows of coloured light bulbs (none of them lit), and rows and rows of buttons. The Fat Controller looked at his reflection in the grey computer screen. On the cab window was stuck a piece of paper saying that the train should not run with carriages with a different version of the windows. Daisy's driver, walked the length of the train and back and shrugged his shoulders, then he got back into the cab and pressed a button marked "standby power supply". Nothing happened. The Fat Controller shook his head from side to side. He climbed out of the cab and checked the label pasted onto the side window. In the space for the destination was scrawled "Sodor" in untidy handwriting. He put his reading glasses on and checked the label again. "Sodor", it said. Then he noticed a big brown envelope tucked beneath the driver's desk. He opened it and went through the wad of papers inside. He showed them to Daisy's driver. "Look! It says Sodor on the label all right. Doesn't it? But this piece of paper is typed out and it clearly says Selhurst. Have a look", said the Fat Controller. He wasn't sure now. They had another look at the label on the train. It could have said Sodor, but then again it might have said Selhurst. They couldn't decide. In the end, the Fat Controller said that Emmie had to be got out of the way and he asked Donald to put her in the carriage sidings with Hatch and Match. Then he went over to the other train. She looked almost the same as Emmie, with too much makeup on. Again, he checked the label and again he couldn't decide whether it said Sodor or Selhurst, so he went through the other papers in the envelope and it turned out that this train was in the right place. "She's here for testing", said the Fat Controller to Daisy's driver. "The Big Railway is too busy so it is being done here." "Hi, dude! I'm Tracey the Turobstar. I'm good at everything". She had begun to burble to herself in a in a boastful tone. Donald had come back wondering what to do next, but the Fat Controller sent him away for a drink of water and asked Daisy's driver to take Tracey to the shed. There were quarrels almost immediately. After a few days, the conversation one morning went like this. Thomas, "Ooh, you nasty girl! You smell of diesel! And you are keeping us awake by running your engines all night long. We have been tired in the morning ever since you arrived. You don't belong here. We know. Go back to the Big Railway." "I need to keep my engines running so that the cleaners can vacuum my carpets", she snarled. Tracey ran her engine up to full speed and spouted black smoke all over Thomas. Tracey replied, "I don't like noisy steam engines. They belong in museums." With a blast on her two-tone horn, she set off for her day's work - she had been given a job on the branch line for the time being - rumbling and muttering. One chilly January morning, Tracey threw a tantrum while out at work, and refused to budge. She fell silent in a sulk. The Fat Controller had to order buses so that the passengers could finish their journeys, and sent for Thomas and Match to tow her back to the shed, where she carried on sulking for the rest of the day. Oliver came to the rescue. The passengers were delighted to see him again, with his old autocoach called Isabel, and he puffed happily up and down the branch line with her all week, until Tracey felt like working again. But she was very lazy and temperamental and in the end she couldn't do any work at all as she needed a special spare part which had to come from Germany. So it was decided that she should be sent back as soon as possible to the Big Railway, together with Emmie, who had never moved since the day she arrived. The move was delayed because a family of robins had nested between two of the carriages and they had to wait until the chicks had flown before Emmie and Tracey could finally go. All the engines howled and shrieked and hooted with joy as Donald and Douglas towed them away. They were never heard of again. How Thomas and Vera fell out. Worst of all was Vera the Voyager, who arrived on her own during the half-term holidays that February. Vera had a deep gruff voice and smelled of drains as well as diesel. She didn't sound anything like a girl. "I'm really fast", she growled. "I can lean over when I go round curves." Gordon hissed, "I'm nearly as quick as you and I can pull lots of carriages. You can't pull anything at all and you've only got four carriages of your own. People have to book up weeks beforehand if they want to travel on you. And the Fat Controller has to charge them more. There's no room if a lot of people want to get on." Vera gave a little shudder and let out a burp. She had bad manners. "I don't need to pull carriages. The passengers can sit inside and I go ever so fast. I've got computers. Dozens of them. And a shop. And every coach has its own engine. I cost five million pounds, so there!" "H'mm", sighed Gordon. "I overheard people on the platform grumbling about you yesterday. They said the seats were too close together. They often had to stand because you were full up. They couldn't see out of the windows. There was nowhere for their luggage. Your toilets were often blocked. You bump and shake the passengers as you go along. They said they would rather travel in my comfortable old carriages, with me pulling them. And you smell of poo. You shouldn't be sharing our shed with us. You take up as much space as three engines. Sir Topham Hatt could have bought lots of us for the money you cost." Off Gordon puffed to get his carriages. Vera was with them all that summer and by the end, the other engines had had enough. One windy autumn night, they decided it was time to get rid of her. They hated Vera, with her bright red paint and smug, leering face, smothered in lipstick. They were tired of the bad smells she gave off. She often woke them when she came back late from her long trips, and then kept them awake by running her engines. Thomas said she was flashy, dirty and stand-offish. She wouldn't even couple to them without having Hatch or Match in between. A plan was worked out. Next day, James was going to take a train on the line that ran along by the sea. It was his favourite route. It was easy work because the line was practically level. The track was built on the old sea wall and ran in and out of tunnels through the red rock, past little coves and along wide beaches. It was a beautiful stretch. During the summer, children on the beach would turn and wave to James as he puffed past, and James's driver would wave back and give a toot on his whistle. But when the sea was rough, the waves splashed right over the track and made James wet, but he never minded, even though water sometimes ran down his funnel. Many times in the winter, the cleaners had emptied bucketloads of seashells from his smokebox. When James's driver came to collect him in the morning, James pretended he had boiler-ache. The Fat Controller said he would give James and his carriages a rest and sent Vera instead. "No", growled Vera. "I only go on long journeys. And I don't want to go along that nasty line next to the sea. It makes me feel seasick." "The people will like you. You are new". The Fat Controller knew she liked to be flattered, though he had heard the complaints too, and that she didn't like to go near the sea. But he insisted, and so off she went. But when she came to the stretch of line by the sea, a huge wave washed right over the line and water poured all over the engines and the other works under her floors. Vera spluttered and came to a stop, whilst the spray from the big waves continued to fall on top of her. By then, and it was later in the morning, James was feeling better and the Fat Controller sent him and his carriages to collect her passengers. They were very pleased to see him and all waved and cheered. Duck was sent to collect Vera but she would not let him pull her. "I'm not going to be pulled by a dirty old-fashioned steam engine. I won't even let myself be coupled to one. You should know that", she said, in a low, hoarse voice. "Go back and get Match", she said bossily. Duck was angry and felt insulted. His green paint was, as always, fresh and shiny. He was very proud of his appearance. The copper cap of his chimney, and his pretty brass safety valve trumpet, were always polished in true Great Western fashion. It wasn't just him that was being insulted; she was insulting everything Swindon and everything Great Western, and on his very own stretch of line, too. He wouldn't have it. With a roar, he let off a jet of steam at Vera and puffed back to his shed to get Match. When he came back, Duck gave her as hard a bump as he dared, and then dragged her back to the sheds. She was a sorry sight, with sea water running out under her doors and swags of seaweed draped over the openings in her roof. "What are we going to do with you? ", asked the Fat Controller, scratching his head. "I'd send you for scrap if you weren't so young and hadn't cost so much." He told Duck to shunt Vera into the sidings where he put the carriages to wait when they needed to be repainted. Vera stayed there, next to Emmie and Tracey, for several months. By the end of that time, ugly streaks of rust were showing through her red paint, the seaweed on her roof had gone dry and her roof was covered with bird droppings. Towards the end of the winter, Edgar was sent to collect her and shunt her into the workshops. They took out her engines and carted them away, where the metal was melted down and made into garden furniture. Her computers were carried out and given to the local school. They cut off her ugly nose and gave her flat ends like ordinary carriages, with proper buffers so that they didn't need Hatch or Match if they need to be coupled to the engines or any of the other carriages. The holes in her roof were covered up. They gave her new windows that the passengers could open if the weather was fine. They took out some of the seats and spaced out the rest, so her carriages were comfortable for the passengers, and fitted her with steam heaters and vacuum brakes so that the steam engines could pull her. Each of her carriages was given her own name: Barbara, Bella, Bertha and Betty. And to finish it all off, she got a new coat of dark red paint with fine gold lines all the way along the sides. When all the work was done, they looked perfectly respectable. Duck came to collect her and she was shunted into the sidings with all the other carriages. Next day - it was the start of the Easter school holidays - Gordon came to collect his train. At the front were Barbara, Bella, Bertha and Betty. "Gosh, how smart you look", he said. "I can hardly recognise you. You are the smartest carriages on the line." Everyone was very pleased with them. The other engines envied Gordon because he was the only one allowed to pull them. The other carriages, too, were a bit jealous at first, but they quickly settled down to their new job. The Fat Controller was pleased at the way things went after he had dealt with Vera. One day he came into the shed and told the engines some news. There was going to be a visit from a brand new steam engine. 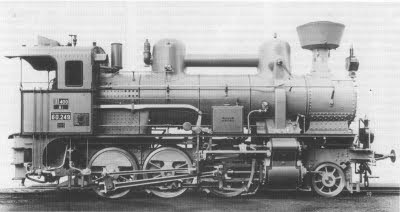 It was a relative of Gordon's, called Tornado. In fact, he looks very much like Gordon, except that he is painted green, he explained. Then he told them about Stan. The Fat Controller said he felt sorry for the engines as they often looked tired. The truth is they were getting old and it was bad for them to be working so hard all the time. Stan was going to come and join them - when he was finished. "What do you mean, when he is finished? ", asked the engines in chorus. "Stan is being made", replied the Fat Controller. "People are starting to build steam engines again, specially for lines like ours, but perhaps the Big Railway will have some too. He will be brand new when he arrives at Sodor. If he behaves well, I shall get more, the same as Stan. Together, we shall show the people on the Big Railway how things ought to be done." "What does he look like?" they asked. "Something like Arthur, but slightly bigger. You know how useful Arthur is. He can do most things quite well if they are not too much for him. Well Stan will be a bit bigger and stronger." He will be able to push and pull Biggie and Ciggie, the same as Oliver does with Isabel. The other engines asked what would happen to them. "Don't worry", replied the Fat Controller. "When Stan and his friends arrive, you will only have to work on special days".